Dr. Jarosewich attended the Ohio Student Mobility Project: Cleveland Discussion on February 6, 2013 at the Westfield Insurance Studio Theatre at the Idea Center at Playhouse Square. The Fordham Institute, Nord Family Foundation, and Community Research Partners convened this public forum in Cleveland to discuss the implications of the research for northeast Ohio’s school districts, charter schools, and communities. 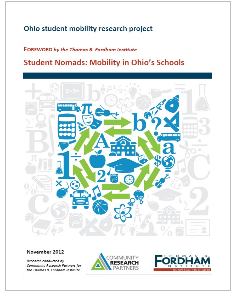 Read more about the Ohio Student Mobility Project and download the report at http://www.edexcellence.net/publications/student-nomads-mobility-in-ohios-schools.html.